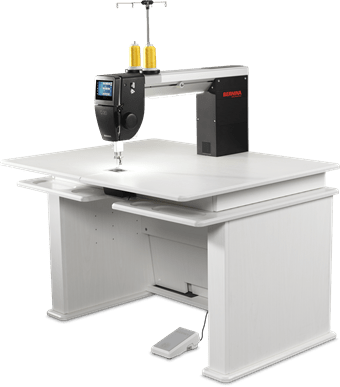 * Offer valid April 18–30, 2019 at any participating US BERNINA Longarm Store. Offer applies to the purchase of BERNINA Q 20, Q 24 machines only. One discount per customer. Savings discount will be applied at time of purchase. Not valid on previous purchases or with any other savings offers or coupons. Some exclusions may apply. Subject to availability. Available while supplies last. Taxes are not included in the total purchase calculation. Customer is responsible for all applicable sales tax. If customer returns the product(s) purchase discount will be lost. Cannot be redeemed for cash. **Offer valid April 18–30 2019 off MSRP at any participating BERNINA Store. Offer applies to BERNINA Sewing, Embroidery, Overlockers and Quilting Machines. Not valid on previous purchases or with any other offers or coupons. Some exclusions may apply. Available while supplies last. Taxes not included in total purchase calculation. Customer is responsible for all applicable sales tax.